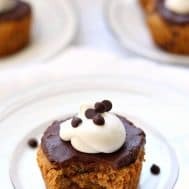 These Paleo Chocolate Chip Cookie Cupcakes contain nothing but real, whole food ingredients yet taste like the ultimate deep dish chocolate chip cookie! Topped with thick chocolate fudge and coconut whipped cream. Gluten free, grain free, dairy free and Paleo. I’ve always had a thing for cookie cakes – does anyone NOT?! I kind of wish ALL cakes could be just like chocolate chip cookies – I’m a much bigger fan of cookie texture than cake texture to tell you the truth. 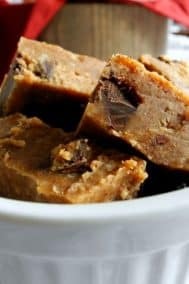 Back in the days before Paleo baking, my favorite things to bake were chocolate chip cookies, cheesecakes, and the ultimate combo – a chocolate chip cookie dough cheesecake. And oh yes – cookie pizzas. I like fun foods and it doesn’t get more fun than making cookies into pizzas and cakes. But anyway. Oddly, even though I made a chocolate chip cookie cake back in October for my birthday, it did not occur to me until a few weeks ago to create a cookie cupcake recipe. 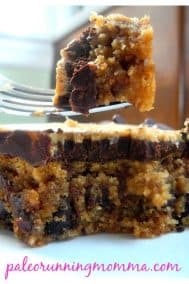 What happened, was that I decided to bake that fudge topped paleo chocolate chip cookie cake (link above) for my family for Passover, yet since I have trouble sticking to recipes, I totally changed it and made something that I consider even better. I didn’t want to post a recipe that was so similar to the last (and the first one was GOOD!) so, I decided to turn this one into cupcakes! YES! And, ditch the cashew butter topping and add coconut whipped cream – since I’m obsessed with putting it on basically everything lately. Remember my key lime pie and lemon bars? It’s like a coconut whipped cream factory in my kitchen and really, who can complain? I have to say, it’s hard to stop making it once you start, and even harder to not put it on every treat you make! 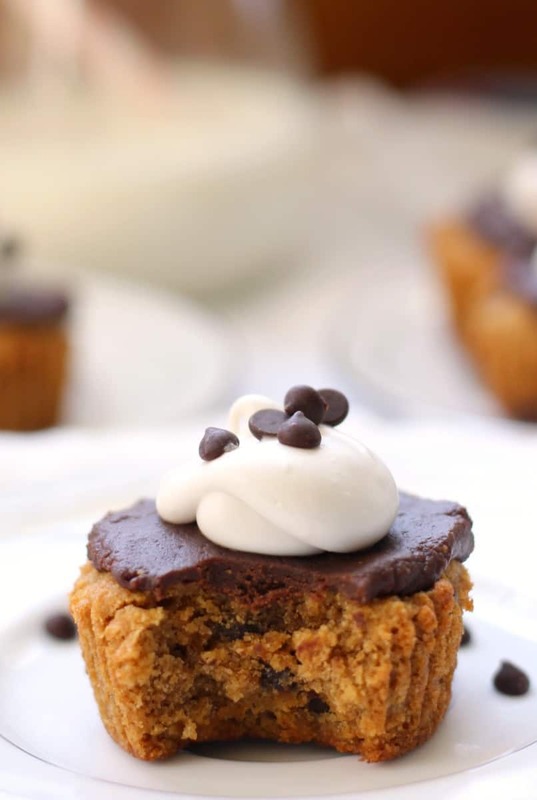 The best part about these cookie cupcakes, in my opinion, is not the coconut whipped cream though. It’s that the entire cupcake is really like your own personal deep dish chocolate chip cookie, so, instead of finishing a cookie and feeling like you need 6 more, you’ll feel VERY satisfied after this one. Make them, trust me! You’ll finish it feeling like you just did something special. Who doesn’t love that feeling? Oh, and whoever you share them with will love you like 10x more than they do now, and that’s even before you tell them that they’re actually good for you. Magic cookie cupcakes, really. And now onto the recipe! 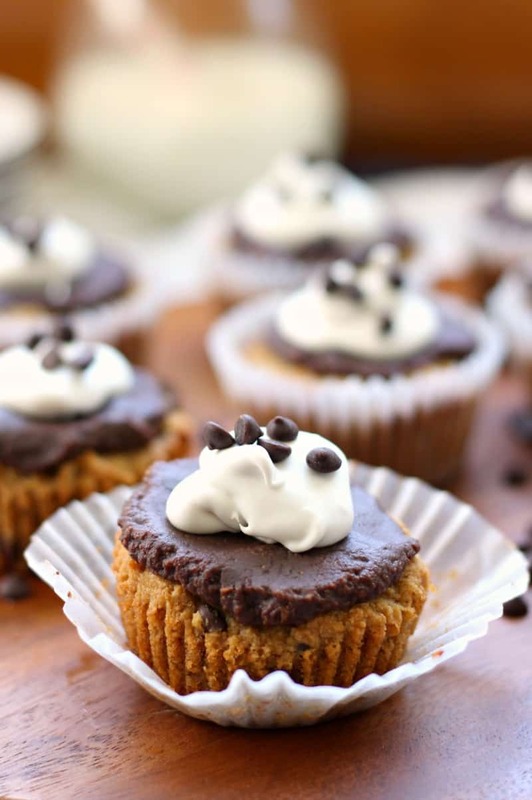 Chocolate Chip Cookie Cupcakes with Chocolate fudge frosting and coconut whipped cream that are gluten free, grain free, dairy free, paleo and taste amazingly decadent! In another bowl, combine the almond flour, coconut flour, tapioca, baking soda and salt. Remove from oven, transfer to wire racks and allow to cool completely before frosting. In a small saucepan over very low heat, melt the chocolate chips while stirring, then stir in the almond butter. Remove from heat and whisk in the almond milk, maple syrup and vanilla until smooth, set aside to cool. With a blender or a whisk, beat the coconut cream until light and creamy, then add the maple syrup and vanilla. 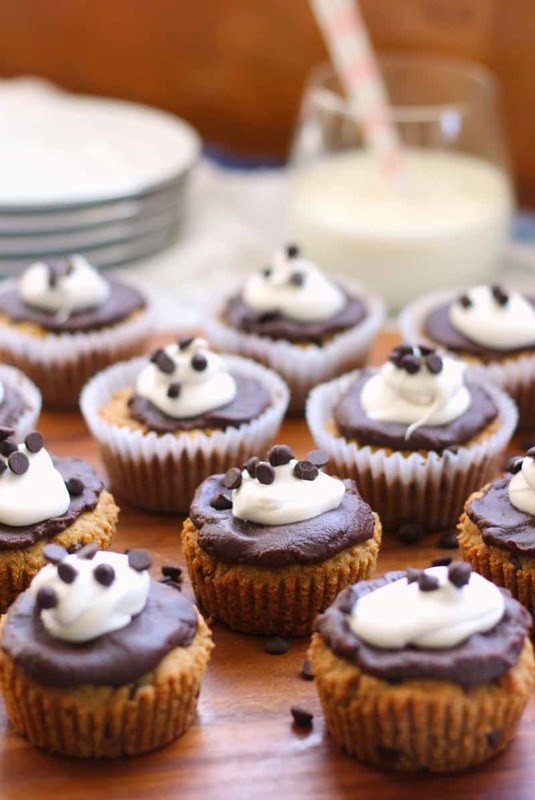 Once cupcakes have cooled, top with a layer of fudge, a dollop of whipped cream, and extra mini chocolate chips! Serve and enjoy! These taste even better after being refrigerated in my opinion! Stop in the refrigerator for up to 3 days. What would you make a cookie into if you could? If I didn’t have to go to work I’d make these. Now. Of course I had to pin this recipe. Have a great Friday Michele. Thanks Jill! Hope you like! omg I have always loved cookie cakes! we used to get them back in high school/college from the great American cookie company in the mall. and then mrs. fields. and then from shoprite. lol so good! and I love cookie cupcakes! I used to make them when I had my cookie business. why did I stop? I know, I think living on LI made me fall in love with cookie cakes back in the day! Make one soon! I always prefer cookies to cake but combining the two is great as well! And I love cupcakes so these sound perfect. I pinned this and will definitely be making them at some point! These are like the cutest things ever. Pinning for later so I can try! Favorite cake? well #1 carrot, #2 chocolate #3 funfetti! Yum!! I love cookie cakes too–I always loved those huge chocolate chip cookie cakes in the sizzling skillets. I think my favorite topping is melted peanut butter! Ooh yes, I’m a sucker for pinning all the skillet cookies on pinterest! These are too perfect. and great photos girl! Thanks! Photos have been a challenge with all the rain we’ve had – eek! LOVE cookie cake and haven’t managed to make a good nut free and gluten free one. 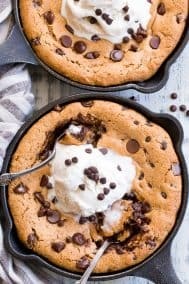 If I can figure out an almond flour substitute though, I think these are happening for my boyfriend’s birthday 🙂 Both of us are serious dessert fans. And I think this fills the request for some sort of cookie dough/brownie/cake combination! You could probably do all coconut flour with these! Not sure the exact amount though, and the texture would be different but I bet still good. If I were to experiment I might do 3/4 cup coconut flour and 3 tbsp tapioca. If you try it let me know! Colored sprinkles always make things fun 🙂 Hope you wind up trying these! I bet they’d be better with sprinkles! my fave type of cake is either really really really good vanilla thats light and fluffy and moist or chocolate and it can be light or dense as long as its good ! im pretty basic. never had a cookie cake ! and i love a good old fashioned buttercream frosting flavored up however you like. i like my frosting to taste like butter not sugar. oddly since having to go GF i dont miss cake itself to much but i had just perfected the perfect choc chip cookie recipe right before finding out i had celiac. oh the irony ! ive never had a cookie as good since but they truly were the best. That is a sad cookie story 🙁 But there are so many good GF cookie recipes! I agree most buttercreams are too sweet so tasting like butter rather than sugar is a good thing. YESSS! I pretty much need to make these right now – even though it’s 6am and everyone’s asleep but #priorities. Oh these are just STUNNING! I love chocolate chip anything – pinned to make soon!! Going to try these today!!! I’ll post a photo and tag you on Instagram. They look so yummy. That happened to me when I made my key lime pie, and with the lemon bars. It’s SUCH good stuff! I like the sound of magic cupcakes. These sound amazing. These look amazing! 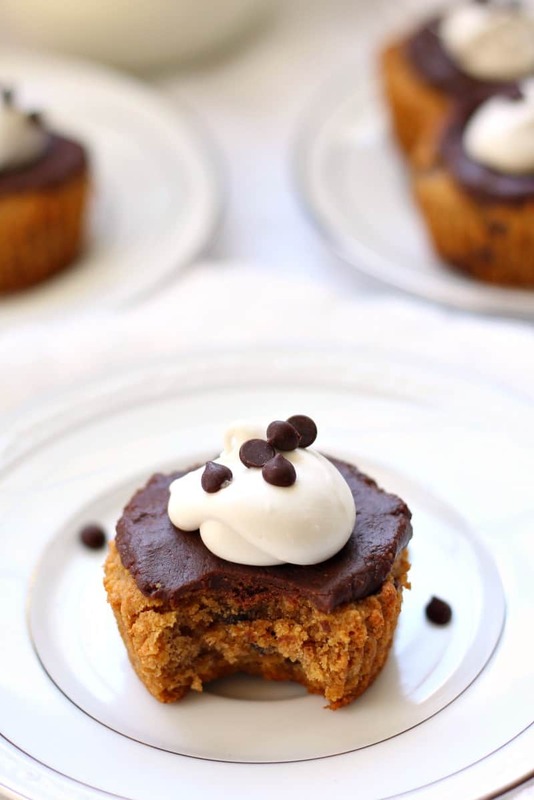 Chocolate chip cookie in a cupcake? Pure heaven. Pinning and hopefully making today!